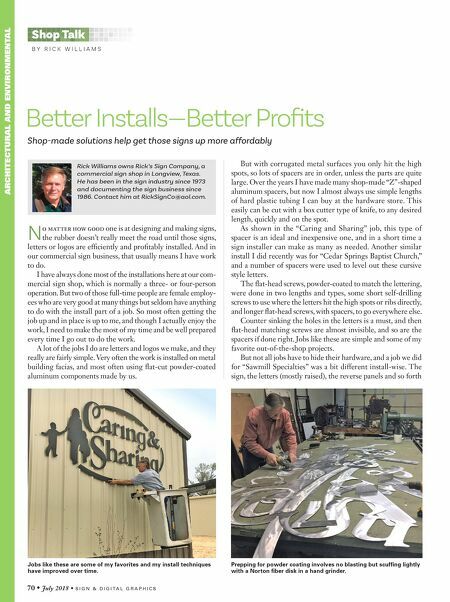 70 • July 2018 • S I G N & D I G I T A L G R A P H I C S ARCHITECTURAL AND ENVIRONMENTAL Better Installs—Better Profits Shop-made solutions help get those signs up more affordably B Y R I C K W I L L I A M S Shop Talk But with corrugated metal surfaces you only hit the high spots, so lots of spacers are in order, unless the parts are quite large. Over the years I have made many shop-made "Z"-shaped aluminum spacers, but now I almost always use simple lengths of hard plastic tubing I can buy at the hardware store. This easily can be cut with a box cutter type of knife, to any desired length, quickly and on the spot. As shown in the "Caring and Sharing" job, this type of spacer is an ideal and inexpensive one, and in a short time a sign installer can make as many as needed. 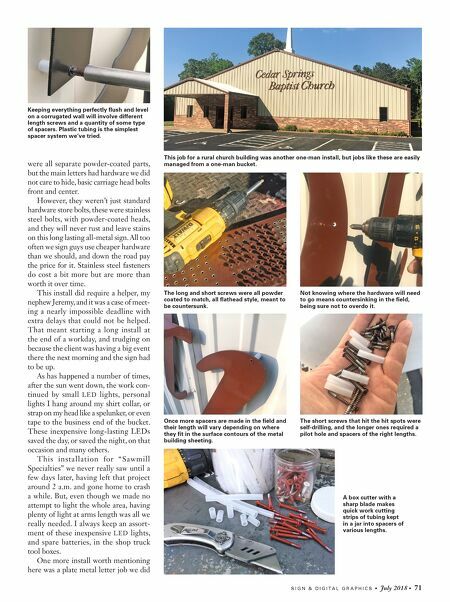 Another similar install I did recently was for "Cedar Springs Baptist Church," and a number of spacers were used to level out these cursive style letters. The flat-head screws, powder-coated to match the lettering, were done in two lengths and types, some short self-drilling screws to use where the letters hit the high spots or ribs directly, and longer flat-head screws, with spacers, to go everywhere else. Counter sinking the holes in the letters is a must, and then flat-head matching screws are almost invisible, and so are the spacers if done right. Jobs like these are simple and some of my favorite out-of-the-shop projects. But not all jobs have to hide their hardware, and a job we did for "Sawmill Specialties" was a bit different install-wise. The sign, the letters (mostly raised), the reverse panels and so forth N o matter how good one is at designing and making signs, the rubber doesn't really meet the road until those signs, letters or logos are efficiently and profitably installed. And in our commercial sign business, that usually means I have work to do. I have always done most of the installations here at our com- mercial sign shop, which is normally a three- or four-person operation. But two of those full-time people are female employ- ees who are very good at many things but seldom have anything to do with the install part of a job. So most often getting the job up and in place is up to me, and though I actually enjoy the work, I need to make the most of my time and be well prepared every time I go out to do the work. A lot of the jobs I do are letters and logos we make, and they really are fairly simple. Very often the work is installed on metal building facias, and most often using flat-cut powder-coated aluminum components made by us. Rick Williams owns Rick's Sign Company, a commercial sign shop in Longview, Texas. He has been in the sign industry since 1973 and documenting the sign business since 1986. Contact him at RickSignCo@aol.com. Jobs like these are some of my favorites and my install techniques have improved over time. Prepping for powder coating involves no blasting but scuffing lightly with a Norton fiber disk in a hand grinder.